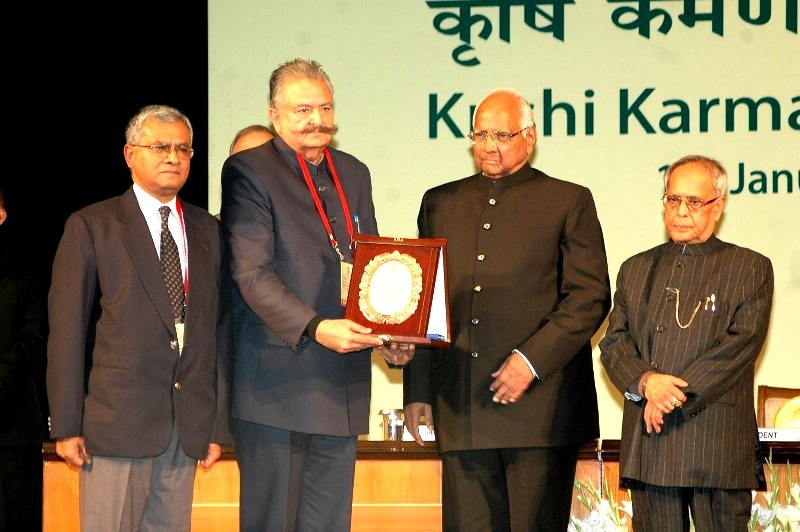 Government today presented the ‘Krishi Karman Award’ to Himachal Pradesh for its outstanding achievements for increasing production and productivity of wheat in the State. President of India Shri Pranab Mukherjee presented the award to Himachal Pradesh Agriculture Minister Sujan Singh Pathania in a function organised in Rashtrapati Bhawan, New Delhi . The award consists of trophy, citation and cash award. Shri Sujan Singh Pathania said that agriculture was the main occupation of 92% of rural population and provides direct employment to 69% of main working population. The percentage contribution of primary sectors to GSDP of the State was 21.31%. About 18.03% of GSDP is contributed by Agriculture and allied sectors alone, which reflects that agriculture sector predominantly contributes to economic growth of the State and any fluctuation in the agriculture production affects economy significantly. He said that out of the total geographical area of 55.67 lac hectares, cropped area was 9.79 lac hectares, owned by 9.14 lac farmers while the net area sown is around 5.42 lac hectares. The average size of land holding in the State was around 1.10 hectare and the marginal and small farmers constitute 86.4% of total farmers. The State receives an average rainfall of 1200 mm, 70% during rainy season and rest during winter. At present, only 19.5% of the total cultivable area in the State is under irrigation and the rest is rainfed.Shri Pathania said that the State Government had given top priority to Agriculture sector and the Government was allocating 12% of the plan resources to Agriculture and allied sectors. He said that State Government had successfully implemented flagship programmes like Rashtriya Krishi Vikas Yojna, National Food Security Mission (Rice and Wheat), Macro- Management of Agriculture, Extension Reforms etc., as a result of which the food grain production and productivity has been increased during last decade. He added that the total food grain production was recorded 15.54 lac tonnes in 2011-12. Wheat is the major food grain crop occupying 80% of the area in Rabi season. The production of wheat was recorded to 6.33 lac tonnes during 2011-12.